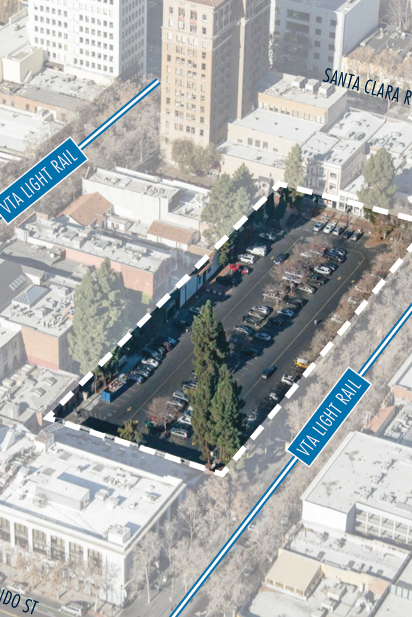 One of the highest-potential areas for development in Downtown San Jose is known as Fountain Alley. This is huge chunk of a city block facing Second St. (the Improv) that is currently being used as a parking lot primarily serving Bella Mia, Original Gravity, Paper Plain, Nemea, and several smaller shops on First Street. In the past, this has been the site of several failed development proposals. CIM was looking at this for a major redevelopment project along with the current site of The 88, then Barry Swenson Builder proposed a 16-story mixed-use project back in 2006. The timing never seemed to be right. Now that the Downtown market is getting serious traction, LaSalle Investment Management is talking to the city about different possibilities for this site. The most exciting scenario is a 24-story residential tower with hundreds of residential units and 25,000 SQFT of retail space (hell yes!). This is a killer infill location at the center of Downtown with immediate access to Light Rail and every amenity you could think of within a three block radius. I really hope this site gets maximum density. Hit the source link for all the details. I like the idea of this spot being developed, but do we really need that much retail space? Almost the whole other side of 2nd street except for one spot has been vacant for years now. More foot traffic = less empty retail spaces. Or so the idea would be. Agreed, there are so many empty retail space in DTSJ. I think the city should focus on getting businesses started in existing retail space at the same time they build up more. They should make it easier to start businesses in DTSJ. I feel like there are so many barriers for anyone to start something. Also, they need to get rid of paid parking. That plus homeless people is what is preventing DTSJ from becoming something great. I agree, empty storefronts help provide continuity in the streetscape and there is so much empty space in downtown. How in a tech "boom" is there so much empty space? and why do we need more, disconnected, retail space? There are far fewer empty storefronts than a couple years ago. This particular spot will help connect the dots between retail gaps and should actually help fill the former Zanatto's space on the other side of second. Now that Downtown is getting critical mass, it's time to plan for two years into the future when many of the remaining empty storefronts will likely be filled up.